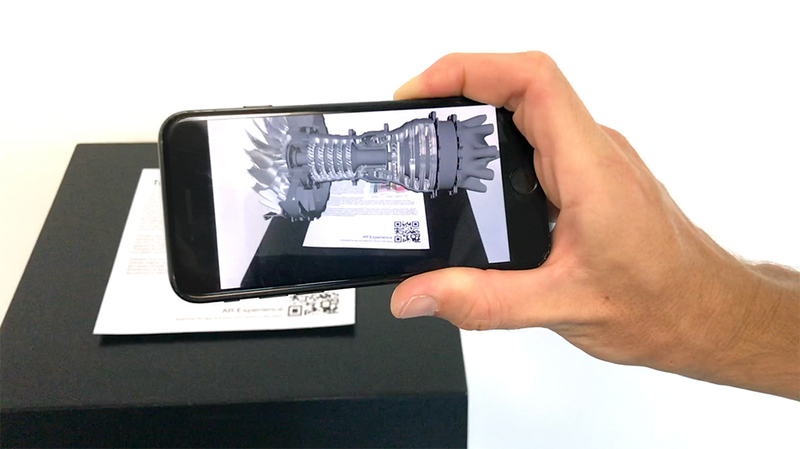 In our continued research into the applications of augmented reality on mobile devices, we've prototyped a display-case concept where a turbojet engine is showcased with all its moving parts. The experience is triggered by a info-plaque, and serves to demonstrate how a simple static informational display can spring to life in the digital world. Such a experience can be extended in endless possibility: info labels, content drill down, video integration, et cetera. One of the amazing features of AR tech on mobile devices is the quality of the tracking, even if the original marker (the plaque) is no longer in view - thanks to the fast graphics processor and the very high definition accelerometer and gyro sensor. This allows for a immersive experience where you can dive into the object displayed and view it from all angles.